The week-end was supposed to be all rainy so I had in mind to do a lot of cooking but in the end it's a beautiful sunny day ahead! 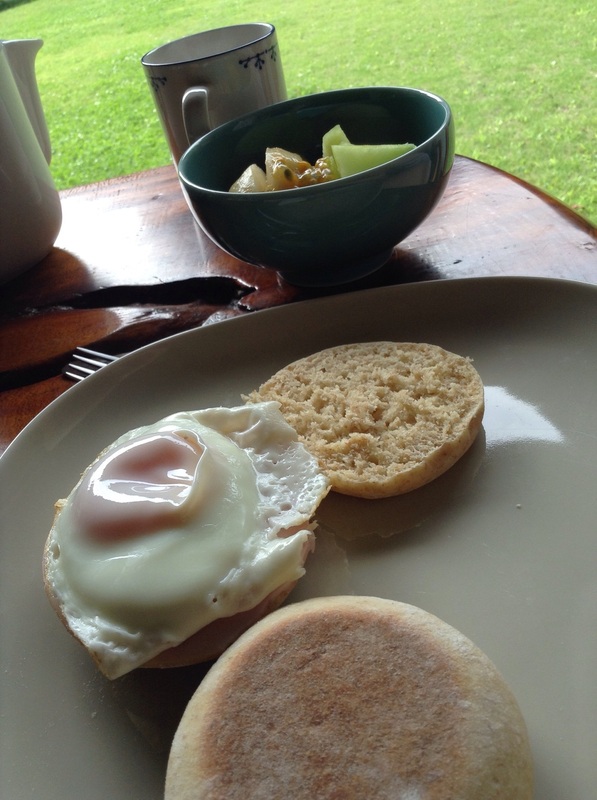 For breakfast I wanted something new to try, and since I bought nice ham and free range eggs, I've been thinking about English muffins. I love English muffins, but until now I've only bought processed ones. So it was time to give it a try. When cooking British (scones, crumpets...) the BBC website is always my best resource and I found there a recipe for English muffins. It is incredibly simple and the result is just stunning! Of course I had to adjust a bit the recipe to my taste and the available ingredients in my cupboard. So I changed the white flour for whole wheat flour, and prepared without the finish with semolina. The recipe is vegetarian: milk-egg-butter are needed. I love the fact that it is baked on a hot plate or in a pan, in summer I like not to have to lit the oven. The preparation is also quite quick because it needs only 1h proving and 30min rest. So basically in 2h you can have your muffins ready. For breakfast I served them with egg and ham, or butter and jam but there are so many ways to serve them! And to complete a fresh fruit salad with seasonal fruits. The perfect start for a Sunday in the garden trimming trees. In a bowl set the flour, and in the middle the yeast, the sugar, the milk, the egg, the salt and the butter. Knead until soft and smooth. Move the dough in an oiled bowl and leave for prove for 1h. When the dough has doubled volume, of a dusted surface roll-out the dough on a 2cm thick rectangle. with a 8cm to 11cm circle cut-out the muffins and leave for prove an other 30 min. Pre-heat a hot plate or a pan at very low heat and set the muffin, bake until golden (5~7min) and flip on the other side and bake again until golden. It's ready to eat!